Wild-caught Alaska Pollock with roasted garlic and Italian breadcrumbs. Real ingredients? Check. Bold flavors? Check. Only 160 calories per fillet? Check and check. 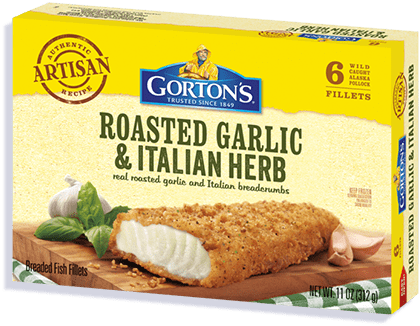 Dashes of Italian spices and savory breadcrumbs give our Roasted Garlic & Italian Herb Artisan Fillets a flavor to remember, for a meal no one will forget. 3. Arrange fish fillets in a shallow metal baking pan, leaving space between fillets. 4. Bake uncovered 17 to 19 minutes* until coating is golden brown and crunchy. Turn fillets over after 12 minutes of cooking. *FULLY COOK FILLETS TO AN INTERNAL TEMPERATURE OF 165°F OR HIGHER BEFORE SERVING. ALASKA POLLOCK, ENRICHED BLEACHED WHEAT FLOUR (FLOUR, NIACIN, IRON, THIAMIN MONONITRATE, RIBOFLAVIN, FOLIC ACID), VEGETABLE OIL (COTTONSEED AND/OR SOYBEAN), WATER, LESS THAN 2% OF: MODIFIED CORN STARCH, YELLOW CORN FLOUR, SUGAR, SALT, GARLIC POWDER, LACTOSE, ONION POWDER, CULTURED BUTTERMILK, WHEY, MALTODEXTRIN, BAKING POWDER (BAKING SODA, SODIUM ALUMINUM PHOSPHATE), SPICES, HYDROXYPROPYL METHYLCELLULOSE, YEAST, PARMESAN AND ROMANO CHEESE (MILK, CHEESE CULTURE, SALT, ENZYMES), NATURAL FLAVOR, PARSLEY, GUM ARABIC, DEHYDRATED ROASTED GARLIC, CITRIC ACID, VINEGAR, DEXTROSE, BUTTERMILK SOLIDS, LACTIC ACID, SODIUM TRIPOLYPHOSPHATE (TO RETAIN FISH MOISTURE), TBHQ (TO PROTECT FLAVOR).